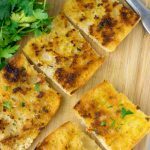 This Garlic Bread Recipe is ready in under 15 minutes and a time saver that the whole family will enjoy in no time. Kids friendly, picky eater approved, this garlic bread will devoured and enjoyed by everyone. Bonus: no one would ever guess it is vegan, dairy free, and easily made gluten free. Preheat your oven to 425°F. Brush baguette or bread with olive oil and generously spread garlic butter on bread. Distribute the garlic butter bread on a prepared sheet pan prepared with parchment paper and bake for around 10 minutes in the preheated oven. Alternatively to the oven version, heat the garlic butter in a sauce pan. Then add the bread slices with the open side down into the garlic butter and let it roast for 2 minutes. The result should be a golden brown top when you take the bread out of the pan.